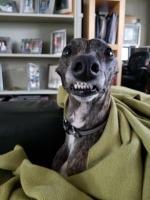 Do you have a whippety question? Enter here your query or keyword. We rescued Fiona at the Local Humane Society on a Monday Morning three years ago. She had been dropped off by owner on Friday as the owner 'was moving'. Humans... She was trembling with fear & she shared my dead mother's birthday. I did not hesitate. She was 3 yo then, & we don't know how we ever lived without her. At first she was very quiet. She has two Schnauzer siblings & she loves them & respects their rank. They love her too & they taught her how to be noisy & chase chipmunks. She is the sweetest dog we have ever had & we are old now. She is smart & gentle & a little shy with strangers. Now she barks likes a madwoman when anyone enters the property; she must have sonar hearing. She barks when the Schnauzers bark just because. She is very loud with that big barrel chest & she smiles now too. I've made her some custom funny shaped fleece lined coats & long neck dog dickies because she gets cold easily & we spend hours outside every day here. She likes her sweaters & blankets & she loves to snuggle cheek to cheek. Whoever gave her up must have loved her because she does know basic etiquette & a few tricks & she takes her turn, defers to the alpha girl & know's how to tell a story. Sometimes she won't stop with the sing-song 'ruh-ruh-ruh-ruh-ruh' story. We are honored to be her humans. So pleased to hear this little dog, found such loving people,as she sounds a sweetie-pie,and looks adorable. I have a beautiful lurcher/whippet and now would never have another,as they are so gentle and kind and of course beautiful to look at and watch. Join in and write your own page! It's easy to do. How? 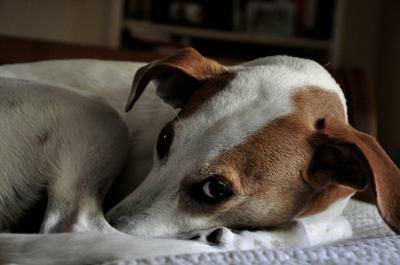 Simply click here to return to Whippet Mix Pictures. With the free e-zine you'll get a house training flash course plus a handy infographic. And your e-mail address is always safe with us, don't worry! But, I AM Smiling for the Camera! Luna, my adorable 2 year-old pup, loves to 'play sticks', pull carrots out of the garden, and best of all....cuddle! Good morning! My husband and I would like to add a whippet to our family. We lost our greyhound in October just a few days shy of thirteen years old. Help your whippet become a perfect companion. Solve behavior problems like mouthing, separation anxiety and car sickness, with simple methods. Find out how to get your puppy ready for leash walking, coursing and showing. Enjoy whippet stories and hound watercolors in an easy to read format. Find out how to house train your puppy in no time with these free instructions, plus a handy infographic as a welcome gift for your subscription to The Whippeteer, our free newsletter! Don't worry your Email is safe with us, subscribe now! Are you planning to get a whippet puppy? Have you just got one? Start on the right foot with these tips! Subscribe in the box below and get the installments of my flash course directly in your mailbox for free. This invaluable course is concise but covers all the basics of getting ready for a puppy. It's divided in 3 short chapters that cover: finding a puppy, shopping list, choosing a puppy and first days at home. You'll receive them every 3 days to let the information sink in and allow you to get it all organized and ready for your new puppy. The Whippet.net does not endorse any dog breeder, including those listed on this site. These listings are provided only for the convenience of our visitors and are not paid ads. TheWhippet.net does not sell dogs and makes no guarantee to the value or health of any dog. TheWhippet.net declines any responsibility for transactions between seller and buyer.